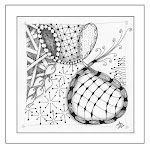 Zentangle - Time To Tangle: Tangle the Library! I look forward to seeing the real thing! It looks amazing in the photo!